A beautiful bossa with an extended AABC form. Minus You tracks are available for piano, bass, and drums in our Rhythm Section Workshop format. In addition to the trio recording, we also have a Solo Piano version; Melody Transcriptions are available for both. One of Jon Davis' most beautifully melodic compositions. It's a bossa with an extended AABC form: 18-measure A and C sections and a 16-measure bridge. The dramatic, elegant melody has an almost classical sound, with its winding directions and unexpected suspensions in relation to the harmony. It starts in an unexpected place: A♯ (the ♯11th of the tonic chord) on the "and" of beat 2, resolving upward and then downward to the tonic. This motif is repeated and developed for the first 12 measures, followed by an unusual gap in the melody: a whole rest on the 13th measure, where the G♯ minor chord of the previous measure planes to Gm7, followed by a fanfare-like "hook" in the 14th measure that re-establishes the E major tonality. The last four measures of the A section alternate Emaj7 and B7sus. The bridge repeats an eight-measure phrase twice, with the last two measures different; the two halves are indicated as B1 and B2. This section has a simpler, contrasting melody and visits G, C, and (in the first half) E♭ major tonalities. The changes have many unexpected chromatic approaches, such as Cmaj7♭5 in the second measure linking B9sus and C♯m7♭5, and E♭maj7 in the first measure of the bridge resolving to D7sus. The intro and coda both vamp on Emaj7 and B7sus, with the coda ending in the "hook" figure, played in octaves by the piano and bass as it is in the head. Our five-page Melody Transcription shows how Jon interprets both the in and out heads. This is a one-staff transcription that doesn't show his entire piano part, but contains the melody and notable inner voicings and lines. Especially at relatively slower tempos such as this, Jon always interprets his melody and rhythm slightly differently every time. The transcription also includes Jon's improvisation over the coda vamp. The Minus You bass and drum parts also show Jon's in head the same as the melody transcription. Bassists and drummers playing along with the Minus You tracks can thus see exactly how Jon plays the melody and thus how best to accompany him. Of course he plays the out head differently; bassists and drummers are encouraged to compare and contrast these two interpretations of the melody. Click on the Minus You tab for format details and audio clips. Bass rhythms are notated below the staff in the piano and drum parts. The bass part shows notable drum rhythms, especially cross-stick accents. The "hook" figure is shown in bass clef in the bass part, while the rest of the piano melody cues are in treble clef throughout. "Just Because Of You is old, that was right after the Jaco days [when Jon worked with bassist Jaco Pastorious], and that's when I started writing tunes, after I got back from Europe. And it was actually dedicated to three people: pianist Fred Hersch, who I was listening to since the very beginning, he's been an enormous inspiration in general, inside voices, harmony; and Jaco, because being around him got me into writing; and the woman I was living with at the time is in some of those titles. Just Because Of You was a little bit of a nod, musically speaking, to Fred Hersch and Jaco. That was in the first batch of tunes, that and Wedding Waltz." Part of this initial set of songs composed by Jon was Did You Hear That Monie (Grandpa Monroe)?, recorded by Bob Weir of The Grateful Dead, Jaco Pastorius and other notable musicians. Jon Davis's Just Because of You minus-bass track is a great choice for bass players who are eager to improve their time feel in the context of a Latin groove; locking in with drummer Steve Johns on this track will go a long way to strengthen any bassist's sense of time. With harmonically sophisticated changes and opportunities to interact with the melody throughout, playing along with Just Because of You is a joy for players of all levels. This is a three chorus recording. The melody cue shows Jon's interpretation for the in-melody chorus. Then Jon solos a whole chorus, and then he returns to A1 for the out melody, so you can hear how he reinterprets his melody. The Coda again shows a fresh melody interpretation. Daryl John's original Bass approach: If you check out the original trio track, you'll find Daryl right in the pocket, emphasizing 1 and 3, while also adding little set ups that help ground his 1 and 3. Just Because Of You is a Latin piece with a relaxed energy level. The drummer on this recording plays an Elvin Jones style Latin groove but you should experiment with many grooves and see which sounds and feels best to you. The form of the tune is AABBA. The 18 bar A sections (phrased 8 +10 bars) make for an even more unique and engaging playing experience. Keeping the form solid is that much more important for the drummer in a piece like this. Play along with the trio-minus-drums! CLIP The form of this recording is straightforward. The coda vamps for 20 measures (5 four-measure phrases as shown in the parts) before the "hook." The entire coda is written out without repeats in the bass and drum parts. 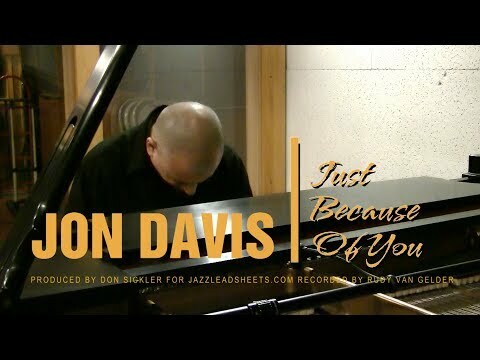 Jon Davis interprets his JUST BECAUSE OF YOU at the Van Gelder Studio. A melody transcription is available for this entire solo piano recording. Jon plays mostly in time, but his melody interpretation is rubato in the classical sense: not freely out of time, but with slight fluctuations around a definite tempo. He plays the bridge as an intro, more freely with fermatas on important chords, before eight measures of Emaj7-B7sus vamp to set up the melody, where our audio excerpt starts. He then plays the melody twice, and vamps out as on the trio recording. In this solo setting his interpretation of the melody is more varied than the trio version (also the case with The Loop and One Up Front). As with the trio Melody Transcription, this Solo Piano Melody Transcription transcription shows the melody line and notable inner voicings and lines. Comparing this transcription to that of the trio recording is a great way to explore the flexibility of Jon's melodies: he writes them in such a way that they can be easily played differently every time. For this session, Jon played Rudy Van Gelder's marvelous Steinway D. We were able to set up cameras and film his performance. You can watch and listen to his sensitive interpretation here and on YouTube.